We went camping this past week. We stayed in a Yurt. 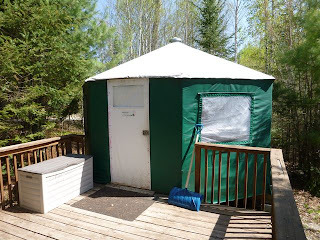 Do you know what a yurt is? Well, let me tell you- it is a wonderful thing. 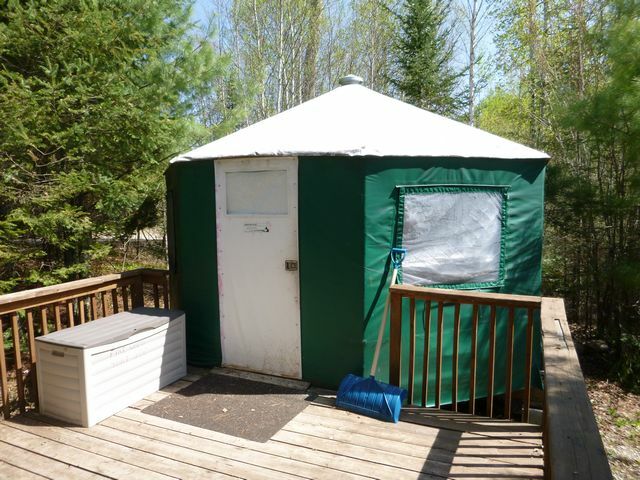 A yurt is a device that saves you from insanity. That's what it is. This was not our exact yurt but ours looked almost exactly like that. Ours had bunk beds inside - enough that all 5 of us had a place to sleep. It also had power and a heater. Which is a very good thing when it doesn't stop raining the entire week you are camping and it is ridiculously cold and the bugs are just out of control and you really need a place to hide from the rain and cold and bugs. In reality we had a very good week...despite the killer mosquitoes and the rain and cold. It was nice to get away and to be offline and to just be together as a family. It would have been nice if the sun had come out to play and if we could have spent some time swimming and playing at the beach as well... but exploring trails at the incredibly beautiful park was still great. I told you it was lovely. Now we have returned to reality and the land of the internets and I kind of want to escape back to our yurt. Except this time with sunshine and no bugs please.